Named after the first President of the Sierra Club, the “JMT” winds from Happy Isles in Yosemite Valley, through three National Parks and two Wilderness Areas before ending at the top of Mt Whitney, the highest point in the continental United States. Sharing 170 miles with the PCT, the path is well constructed with grades that can be handled by mules. However, that does not mean it’s an easy stroll. It crosses eight passes near or over 11,000 feet including Forrester Pass, the highest point on the entire PCT. Huge vistas, beautiful mountain lakes, plentiful wildlife and a taste of wilderness travel place the JMT on many people’s hiking bucket list. With good reason; the stark beauty of the Sierra Nevada is hard to beat anywhere in the world. One hundred million year old granite uplifted into mountains and shaped by glaciers results in some incredible sights, and also a trail that is challenging. While located and graded very well, nothing changes the fact that there are tremendous elevation changes. The vast majority of hikers begin at the northern terminus, (Happy Isles in Yosemite National Park) which sits at 4,000 feet. Twelve miles later, hikers are already near 10,000 feet. If that first climb doesn’t leave you breathless, the scenery will. Iconic views such as Nevada Falls and Half Dome are just the start of a daily parade of incredible vistas. The climbs and drops, along with accompanying views, continue along the length of the trail. The most difficult climb is saved for the end however. From a “low” point of 10,700 feet, the trail begins the assault on the southern terminus of the trail, Mt Whitney’s peak. Over 7 miles the path climbs nearly 5,000 feet through broken granite. The fact that there is only about 60% of the oxygen available at sea level doesn’t help either. The effort is worth it though. You’ve finished the trail and are at 14,505 feet, the highest point in the continental US. Take some time to enjoy the views and your accomplishment. Although you are done with the trail at this point, there’s no shuttle standing by. There’s still a bit of hiking to do. The closest road (Whitney Portal) is 10 miles and 6,600 vertical feet away. Most thru-hikers hike from North to South. The northern terminus is at the eastern end of Yosemite Valley inside Yosemite National Park. From the San Francisco/San Jose area, CA-120 East get you close enough to follow the signs to the park. In addition, there are public transportation options to the park and free bus service throughout the park. There is also public transportation between Yosemite and Lone Pine, the town closest to Mt Whitney. Think about all those inspirational quotes from John Muir. Most of them were written about this very area. There are “take your breath away” vistas on a daily basis. The iconic views are just one of many reasons to hike this classic trail though. The distance (211 miles, plus another 10 to get to a paved road) is short enough to be doable for most hikers with a two week vacation, but is packed with challenges and wilderness experiences. The last 150+ miles are nowhere near a road. With the entire trail within a national park or wilderness area, wildlife is plentiful. The change in elevation brings a variety of both flora and fauna to experience. I saw a variety of wildlife but was struck by the large predators that roam this complete ecosystem. Bear, bobcat and coyote shared the spotlight with deer, marmot, pika and more. Not seen by me, but in the park are beaver, bighorn sheep and mountain lion. John Muir called the Sierra’s the “gentle wilderness” and summer/early fall weather lives up to that name; being typically sunny and dry. There is all that pesky winter snow to consider however. Depending on the year, snow can remain deep on the higher passes into July. That snowmelt can also mean difficult stream crossings and plenty of mosquitoes through early summer. The best time to hike is generally July through September with my personal preference towards the September end. This period is typically dry and pleasant, though thunderstorms and/or snow at higher elevations can happen at any time. I hiked the trail beginning just after Labor Day. Most hiking was done in shorts and a t-shirt but I was glad to have brought a hat and gloves for one snowy pass. I used a 20 degree bag and needed all the insulation on a couple higher camps. 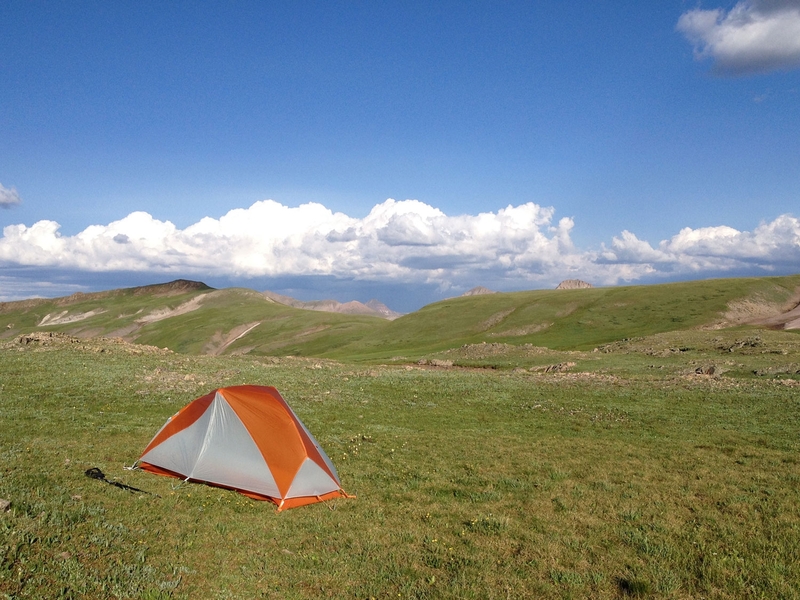 With the number of hikers restricted by the permit process, there is no issue finding a spot to camp. I used both the JMT Pocket Atlas (Blackwoods Press) and the Guthook phone app and either reliably showed where camping options were located. There were sometimes other campers in the areas, but I never felt crowded. Bring a tent. There are no shelters and with long stretches at high elevation, there will be times when there’ll be no trees to hang a hammock from. Bearbagging your food is not good enough. Bring or rent a bear canister. One of the beauties of the JMT is all the lakes and streams along the way. Despite hiking late in the season, and during a drought, water was never an issue. The guides mentioned above both listed water options and I never carried over 2 liters. While much of the water appears crystal clear at high elevations, I filtered all my water. It just seems like cheap insurance to avoid marmot poo. Resupply options are interesting, to say the least. They start easy and get progressively more difficult as you travel north to south. Twenty miles in, there is a post office at Tuolumne Meadows. At sixty one miles, Red’s Meadow Resort is just off the trail. They will hold packages for a fee and also have a grocery on site. At around 90 miles, the Vermillion Valley Resort (VVR) is an option. It is either a 7+ mile hike off the JMT or a shorter hike and a boat ride. Take the boat. They hold packages for a fee, have a small grocery and with a restaurant, laundry and hotel, provide a nice spot to spend the night. This was my last resupply stop. It took a bit of work to fit 130 miles worth of food into my bear canister, but by standing on the lid, I made it happen. At 110 miles, Muir Trail Ranch (MTR) is another resupply option. They offer overnight accommodations and will hold a resupply, but I did not use them for a few reasons. For 2018, their cost to hold a resupply bucket is $80. The charge to stay in their tent cabins is $170/person/night. Despite the costs, they were actually booked solid when I was in the area. In addition, they closed for the season on the day after I planned to be passing through, too close for comfort. Everything at MTR must be hauled in well beyond any roads so I understand the prices. It doesn’t mean I have to pay them however. Beyond MTR the options get difficult or significantly more expensive. There are either long walks down side trails or rendezvous with a pack animal at a premium price. Perhaps the biggest challenge with the JMT is just scoring a permit. If you want to start in Yosemite, plan on faxing in an application 24 weeks before your planned start date. By the end of the day, you will find out if you were successful. You probably were not. Apparently, there is such demand that well over 90% of all applications are denied. One hiker I met on the trail had been denied 22 times before she received a permit to start at Happy Isles Trailhead. BTW –The permit comes with a special bag to carry in case the need arises on Mt Whitney itself. Apparently the mountain is a “no poop zone.” I don’t know if there’s much of a learning curve to using the bag, but thankfully I didn’t have to find out. If there was ever a “bucket list” trail, this is it. It is hard to imagine jaw dropping views, numerous wildlife sightings, a complete thru-hike and reaching the high point of the lower 48 states, all in one 200+ mile package, but here it is. All this hiking goodness does come at a cost though. Permit aggravations, carrying the weight of a bear canister over big climbs and through thin air just add to the satisfaction you’ll feel at the finish though. Is the JMT worth the trouble? You bet it is. Start planning your hike waaay in advance by going to the National Park Services website. My JMT Pocket Atlas is one of “Erik the Black’s Ultralight Trail Guides. The Guthook phone app will be in your App Store. If you’re interested in what my hike was like, along with hikes of the Colorado Trail and Long Trail; there’s a book about it. Not sure whether to hike this trail? Perhaps a few quotes from John Muir himself will help you decide. All the world lies warm in one heart, yet the Sierra seems to get more light than other mountains. The weather is mostly sunshine embellished with magnificent storms, and nearly everything shines from base to summit – the rocks, streams, lakes, glaciers, irised falls, and the forests of silver fir and silver pine. And my personal favorite: Of all the paths you take in life, make sure a few of them are dirt. Highest point in Colorado and 2nd highest in the continental US, Mt Elbert (14,433 ft) is reflected in Twin Lakes. 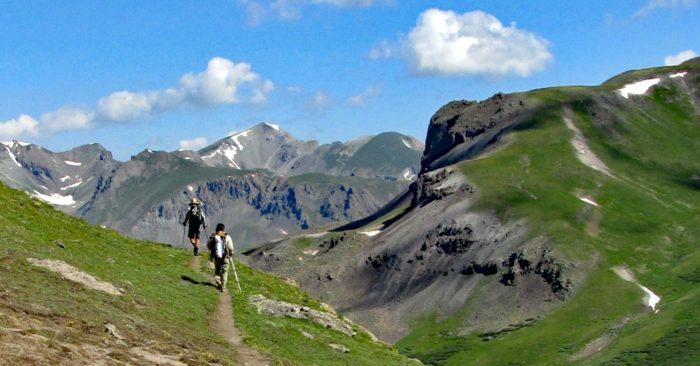 Often called “the most beautiful long trail in America,” the Colorado Trail (CT) winds across eight named mountain ranges, five river systems, six wilderness areas and some of the most awe inspiring sections of trail in the Rockies. The CT shares about half of its mileage with the Continental Divide Trail. 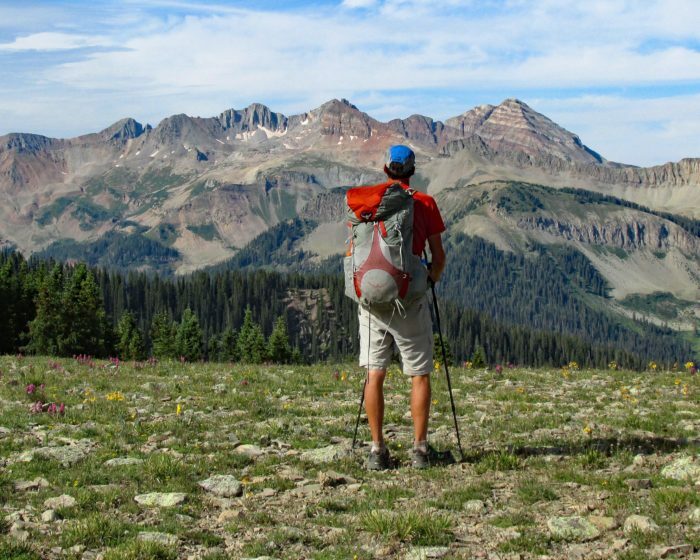 The trail starts near Denver; ending 485 mile southwest at Durango. With an average elevation of over 10,000 feet, 90,000 feet of climb, few convenient resupplies and little support structure, this is not a trail to be taken lightly. The route does not go over any major peaks, but winds around them. In addition, the trail is well constructed and well maintained, with no “scrambling” required. Despite this, with big mountains come big climbs and big descents; often lasting five miles or more at a time. The highest point on the trail is 13,271 feet and long stretches are above tree line. Most thru-hikers hike from east to west. The climb is more gradual, allowing for a better opportunity to acclimate to the mountain elevations. The Eastern/Northern terminus is located at 11300 Waterton Road, Littleton, CO 80125. From Denver, take I-25 South to C-470 West to CO Hwy 121 South. After 4.5 miles turn left onto Waterton Rd. There is both air and bus service between Durango and Denver. Because it’s epic. The fact that it was my first thru-hike might affect my opinion, but the CT was pretty much everything I hoped for in an adventure. The scenery was second to none with incredible views on a daily basis. 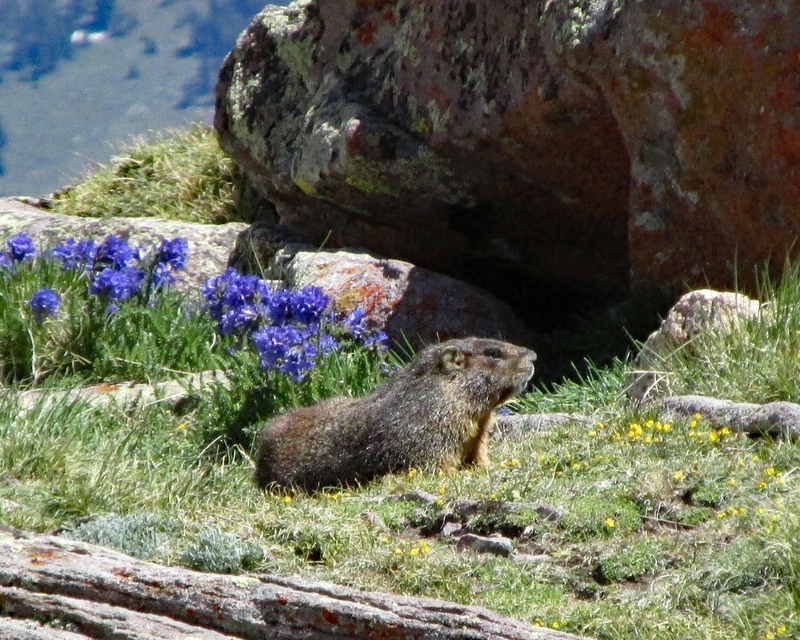 I saw plenty of mountain wildlife such as marmot, pika, elk and big horned sheep. 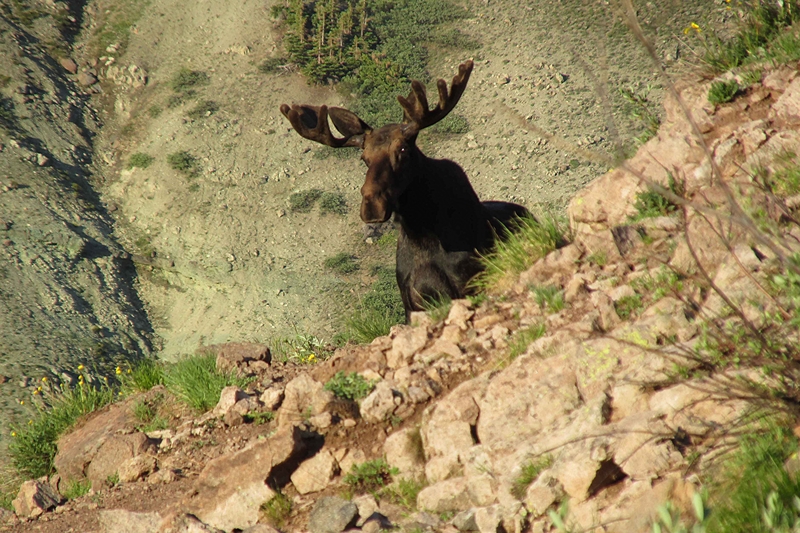 I even had a close encounter with moose at 12,000 feet. The trail was challenging, but doable. The sun shined every day. There were no crowds, no permit issues. I even was able to stop a steam locomotive to use as a resupply shuttle! While the CT was perfect for me, that doesn’t mean it’s a great trail for everyone. Is also important to know what this trail is not. The CT is not a social trail the way the AT is. I met less than a dozen other thru-hikers the entire way. As with most trails, it is getting significantly more popular (Over 300 successful end-to -end completions in 2017), but don’t expect crowds of other thru-hikers. There were no shelters, little trail magic, and resupplies were far apart. CT hikers need to be absolutely self-reliant. High-altitude hiking has its downsides too. Morning sunshine often turned into afternoon thunderstorms, which were less than fun above tree line. I was postholing through snowfields in July. And there’s that pesky lack of oxygen. One fellow backpacker, a successful AT thru-hiker, told me that between the altitude and lack of support structure, the CT was actually the tougher hike for her. It all depends on what you are looking for. 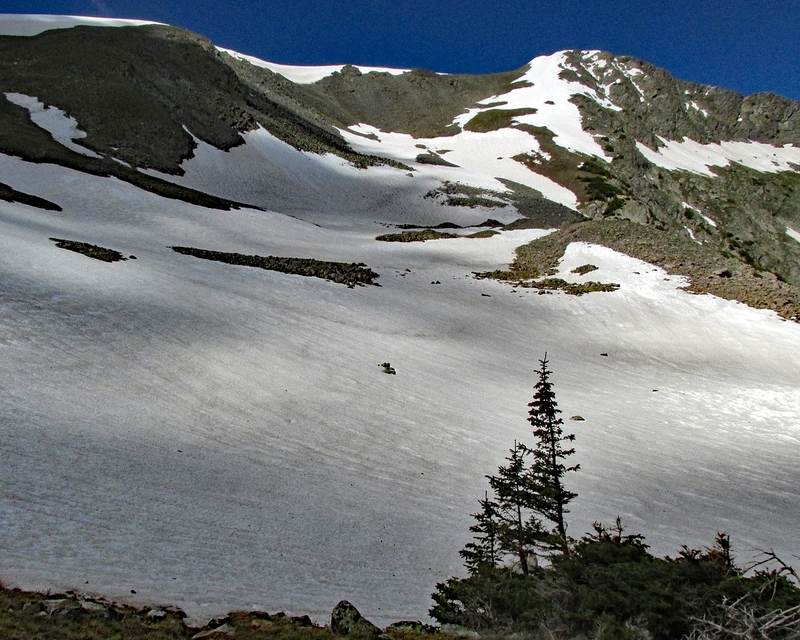 On a typical year, the snow is melted back enough to start hiking east to west by the end of June. My starting date was June 21 and I dealt with significant snow at higher elevations for the first 150 miles. Starting from the west should be put off until at least early July. Winter returns early so plan your hike to be complete before October. I was on the trail for 32 days and the sun did shine on every one of them. Bring sunscreen. There were also many afternoon thunderstorms which were occasionally violent. These need to be respected, especially when traveling above tree line. Daytime temperatures are normally pleasant, but the thin, dry atmosphere does not hold the heat once the sun sets. On several nights my 20 degree bag was near its limit. One hiker I met tried to get by with a 40 degree bag and by building fires on cold nights. During one long stretch above tree line (no firewood) he spent a rather uncomfortable night doing hours of calisthenics as a Plan B attempt to stay warm. My highest camp at 12,500 feet. Just off the photo to the right, White Pine was on his 20th set of Jumping jacks. Nearly all of the CT route is within either National Forest or Wilderness Areas. The only permits required consisted of an occasional self-issued form at a kiosk along the trail. With few exceptions, camping involved finding a flat area that had obviously been used by others before. The Colorado Trail Databook lists most of the sites I used. Generally, there was a water source in the vicinity and I only dry camped on one occasion. The only “amenity” at most camp areas was an occasional fire ring. Bring a tent. There are no shelters and with long stretches at high elevation, there will be times when there’ll be no trees to hang a hammock from. While I never saw a bear, they are in the area. I “bear bagged” my food at night when a tree was available. Despite the high altitude, the route was relatively abundant with creeks and ponds. The longest stretch I had between water sources was 15 miles, though my early season departure meant several sources were being fed by snowmelt. Significant portions of the trail are open to cattle grazing. Many of the higher creeks are inhabited by beaver. Bring a filter and use it. The CT has the greatest resupply shuttle ever. 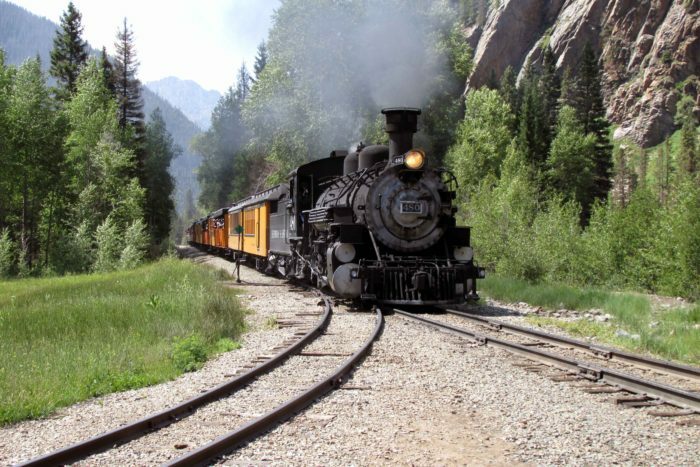 After 400 miles of hiking, deep within the Weminuche Wilderness, there is a railroad track. Time it right and you can wave down a steam locomotive of the Durango & Silverton Railroad. Hand the conductor the fee and ride the train into your resupply. Overall, resupply options are not abundant. Towns within easy reach range from 60 to 105 trail miles apart. There are some interesting resupply options though. There is free transit service with a bus stop at a trailhead near the town of Frisco. Another bus stop at a trailhead 14 miles further down the trail makes for an easy slackpack day. I resupplied at Frisco (mile 104), Twin Lakes (175), Salida (253), Lake City (357) and Silverton (405 at the train). Boxes can be sent to each town, or groceries are available. The grocery selection is thin at Twin Lakes however. The trail also passes right by a general store at Mt. Princeton (mile 230). I did not resupply there, but had one whale of a 2nd lunch. If you are looking for big mountain scenery, enjoy being self-sufficient in the wilderness and have the time to hike 500 miles, the CT may be the trail for you. Epic views, wildlife sightings, incredible wildflower displays and plenty of sunshine are highlights. Thunderstorms, 5-10 mile climbs and postholing might be considered drawbacks. A great place to begin research on the trail is at the Foundation’s website, coloradotrail.org. The site has quite a bit of information as well as an online store that sells the Guide and Databook. If you are looking for a journal type book to get a feel for the hike from one person’s perspective, I can recommend this one. Regardless, when you finish the trail and get to Durango, swing by Carver’s Brewpub. When I finished they were providing thru-hikers with their first glass of Colorado Trail Nut Brown Ale on the house. I’m not sure a beer ever tasted any better.